Wouldn't you know it! Sitting right in front of me, on my desk, another 8 Track I recently picked up( and had blanked on). Got some new tapes today!! A special benefactor sent me a box of tapes, and a whole bunch of them are new to my collection. Well, I have Surf's Up and Love You on 8 track (both sealed). Fascinated by your collection, BTW! I had a few 8 tracks, but no Beach Boys. Still have many cassettes, though, including CATP/PS, Ultimate Christmas, and both of Carl's solos. Bgas, I noticed that you hadn't uploaded The Beach Boys 1985. Probably just an oversight as I'm sure you have it in your collection. Yeah. One would think that, but they'd be wrong. Now I must find a copy; yours looks very excellent. I hope I'll find one at least as nice. If you find another one, please let me know! Perhaps they just "slipped on through". Nice to see you keeping up the interests! 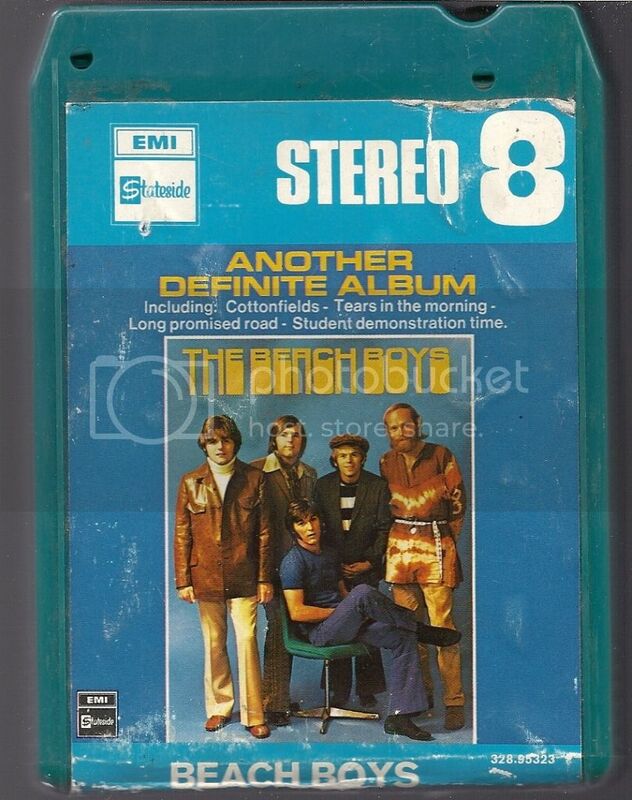 I have never heard an 8 track before. For those a little older than me, what is better quality: an 8 track or a cassette tape? you have not lived until you hear the distintive clunk of an 8 track tape player changing programs while driving down the road. it usually happened halfway thru a track. plus one has to experience a player eating the tape after hitting a bump or pot hole. I guess the actual tape width used would be about the same for either one. The best sound came from 4 Track cartridges, which had twice as much space to work with, hence greater sound quality; problem being, of course, they were invented to have the roller in the machine, not the cartridge, which effectively killed the format. I remember making my first SMiLE versions on cassette tape. Record a section, pause, record a section, pause. It sounded like crap. Good to have first rate digital editors now. Did the tipical 8 track player have a record button? Sounds like a CD in that you could only play them at first. Ha ha I actually played tbese in my car in HS. This was it for car stereo besides the radio. Hissy as all bell and the track changes more often than not, jarring. When a tape would fail we would hang on to tape and throw the shell out the window. Good Times! Oh yeah you can record on them...Id look for factory blanks though. The quadraphonic players and tapes sell for decent money. Some of the top of the line units sound okay. No where good as open reel tapes or cassette. Hey Little Tomboy is creepy. Banging women by the pool is fun and conjures up warm summer thoughts a Beach Boys song should. The drawing cover is hilarious. Mike looks like Mike. That's it. This cracks me up. Yup, that is definitely an album. Like any format it depended on the pressing mostly. I came in on the very end of the 8-track era. Generally I didn't find the sound worse than cassette, but I found them much harder to work with because our players had no rewind or fast forward. The track changing thing would happen too. Powered by SMF 1.1.21 | SMF © 2015, Simple Machines Page created in 0.174 seconds with 21 queries.